Amenemhat IV (also Amenemhet IV) was the seventh and penultimate pharaoh of the 12th Dynasty of Egypt (c. 1990–1800 BC) during the late Middle Kingdom period (c. 2050–1710 BC), ruling for over nine years in the late 19th century BC or the early 18th century BC. Amenemhat IV may have been the son, grandson or step-son of his predecessor, the powerful Amenemhat III. His reign started with a two-year coregency with Amenemhat III and was seemingly peaceful. He undertook expeditions in the Sinai for turquoise, in Upper Egypt for amethyst and to the Land of Punt. He also maintained trade relations with Byblos as well as the Egyptian presence in Nubia. Amenemhat IV built some parts of the temple of Hathor at Serabit el-Khadim in the Sinai and constructed the well-preserved temple of Renenutet in Medinet Madi. Amenemhat IV's tomb has not been identified, although the Southern Mazghuna pyramid is a possibility. He was succeeded by Sobekneferu, possibly his sister or step-sister, whose short reign marked the end of the 12th Dynasty and the beginning of the Middle Kingdom's decline into the Second Intermediate Period. Amenemhat IV was the son of a woman named Hetepi. Hetepi's only known attestation is an inscription on the wall of the temple of Renenutet at Medinet Madi where she is given the title of "King's Mother" but not those of "King's Wife", "King's Daughter" or "King's Sister". 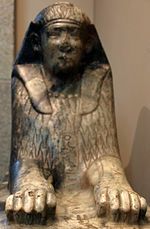 Consequently, her relation to Amenemhat III is unknown and she may have been non-royal. The relation of Amenemhat IV to Amenemhat III is similarly uncertain; the former could have been the son or grandson of the latter. Similarly, while Manetho states that he married his half-sister Sobekneferu, this claim is not yet supported by archaeological evidence. In particular, Sobekneferu is not known to have borne the title of "King's Wife". Instead, the egyptologist Kim Ryholt proposes that Amenemhat IV was adopted by Amenemhat III and thus became Sobekneferu's step-brother, thereby explaining the Manethonian tradition. Amenemhat may have died without a male heir, which could explain why he was succeeded by Sobekneferu. However, some egyptologists, such as Aidan Dodson and Kim Ryholt, have proposed that the first two rulers of the 13th Dynasty, Sobekhotep I and Amenemhat Sonbef, were his sons. Amenenmhat IV may have been Sobeknefru's spouse, but no evidence currently substantiates this hypothesis. Amenemhat IV first came to power as a junior coregent of his predecessor Amenemhat III, whose reign marks the apex of the Middle Kingdom period. The coregency is well attested by numerous monuments and artefacts where the names of the two kings parallel each other. The length of this coregency is uncertain; it could have lasted from one to seven years, although most scholars believe it was only two years long. The Turin Canon, a king list redacted during the early Ramesside period, records Amenemhat IV on Column 6, Row 1, and credits him with a reign of 9 years, 3 months and 27 days. Amenemhat IV is also recorded on Entry 65 of the Abydos King List and Entry 38 of the Saqqara Tablet, both of which date to the New Kingdom. In spite of the Turin canon, the duration of Amenemhat's reign is uncertain. It was given as eight years under the name Ammenemes in Manetho's Aegyptiaca. In any case, Amenemhat's rule seems to have been peaceful and uneventful. Amenemhat IV is well attested by contemporary artefacts, including a number of scarab- and cylinder-seals. Four expeditions to the turquoise mines of Serabit el-Khadim in the Sinai are dated to his reign by in-situ inscriptions. The latest took place in his ninth year on the throne and could be the last expedition of the Middle Kingdom, since the next inscription dates to Ahmose I's reign, some 200 years later. In his Year 2, Amenemhat IV sent another expedition to mine amethyst in the Wadi el-Hudi in the south of Egypt. The leader of the expedition was the assistant treasurer Sahathor. Farther south, three Nile-records are known from Kumna in Nubia that are explicitly dated to his Years 5, 6 and 7 on the throne, showing that the Egyptian presence in the region was maintained during his lifetime. Important trade relations must have existed during his reign with the city of Byblos, on the coast of modern-day Lebanon, where an obsidian and gold chest as well as a jar lid bearing Amenemhat IV's name have been found. A gold plaque showing Amenemhat IV offering to a god may also originate there. Recently, continuing excavations at Wadi Gawasis on the Red Sea coast have produced two wooden chests and an ostracon inscribed with a hieratic text mentioning an expedition to the fabled Land of Punt in Year 8 of Amenemhat IV, under the direction of the royal scribe Djedy. Two fragments of a stela depicting him and dating to his Year 7 were found at Berenice on the Red Sea. Amenemhat IV completed the temple of Renenutet and Sobek at Medinet Madi started by Amenemhat III, which is "the only intact temple still existing from the Middle Kingdom" according to Zahi Hawass, a former Secretary-General of Egypt's Supreme Council of Antiquities (SCA). The foundations of the temple, administrative buildings, granaries and residences were uncovered by an Egyptian archaeological expedition in early 2006. Amenemhat IV possibly also built a temple in the northeastern Fayum at Qasr el-Sagha. Amenemhat IV is responsible for the completion of a shrine at the temple of Hathor in the Sinai and may also have undertaken works in Karnak where a pedestal for a sacred barque inscribed with Amenemhat III and IV names was found in 1924. Less than 10 years after Amenemhat IV's death, the 12th Dynasty came to an end and was replaced by the much weaker 13th Dynasty. Although the first two rulers of this dynasty may have been sons of Amenemhat IV, political instability quickly became prevalent and kings rarely ruled beyond a couple of years. The influx of Asiatic immigrants in the Nile Delta which had started during the reigns of Amenemhat IV's predecessor accelerated under his own reign, becoming completely unchecked. Under the 13th Dynasty, the Asiatic population of the Delta founded an independent kingdom ruled by kings of Canaanite descent forming the 14th Dynasty and reigning from Avaris. Around 80 years after the reign of Amenemhat IV, "the administration [of the Egyptian state] seems to have completely collapsed", marking the start of the Second Intermediate Period. The remains of the Southern Mazghuna pyramid, possibly Amenemhat IV's tomb. The tomb of Amenemhat IV has not been identified. He is nonetheless often associated with the ruined Southern Mazghuna pyramid. No inscriptions have been found within the pyramid to ascertain the identity of its owner, but its architectural similarity with the second pyramid of Amenemhat III at Hawara led egyptologists to date the pyramid to the late 12th or early 13th Dynasty. Less likely, Amenemhat IV could have been interred in Amenemhat III's first pyramid in Dashur, since his name has been found on an inscription in the mortuary temple. At Dahshur, next to the pyramid of Amenemhat II, the remains of another pyramid dating to the Middle Kingdom were discovered during building works. The pyramid has not yet been excavated, but a fragment inscribed with the royal name "Amenemhat" has been unearthed. It is therefore possible that this pyramid belongs to Amenemhat IV, although there are also kings of the 13th Dynasty who bore the name Amenemhat and who could have built the pyramid. Alternatively, the relief fragment may originate (come) from the nearby pyramid of Amenemhat II. ^ a b c d e f g h i K.S.B. Ryholt: The Political Situation in Egypt during the Second Intermediate Period, c. 1800–1550 BC, Carsten Niebuhr Institute Publications, vol. 20. Copenhagen: Museum Tusculanum Press, 1997, excerpts available online here. ^ a b Jürgen von Beckerath: Handbuch der ägyptischen Königsnamen, Münchner ägyptologische Studien, Heft 49, Mainz : Philip von Zabern, 1999, ISBN 3-8053-2591-6, see pp. 86–87, king No 7. and p. 283 for the dates of Amenemhat IV's reign. ^ Alan H. Gardiner: The Royal Canon of Turin, Griffith Institute, Oxford 1997, ISBN 0-900416-48-3, pl. 3. ^ Hense, M.; Kaper, O.E. (2015). "A stela of Amenemhet IV from the main temple at Berenike". Bibliotheca Orientalis. Nederlands Instituut voor het Nabije Oosten. 72 (5–6): 585–601. ^ The temple of Renenutet at Medinet Madi or Narmuthis. ^ Ian Shaw: Ancient Egypt: A Very Short Introduction, Oxford University Press (2004), ISBN 978-0-19-285419-3, excerpt available online, see p.
^ Labib Habachi: New Light on Objects of Unknown Provenance (I): A Strange Monument of Amenemhet IV and a Similar Uninscribed One, Göttinger Miszellen (GM) Vol. 26, Göttingen (1977), pp. 27–36. ^ a b Flinders Petrie, G. A. Wainwright, E. Mackay: The Labyrinth, Gerzeh and Mazghuneh, London 1912, available online. ^ Mark Lehner, The Complete Pyramids, Thames and Hudson, London 1997, p. 184. ISBN 0-500-05084-8. Wikimedia Commons has media related to Amenemhat IV. Ingo Matzker: Die letzten Könige der 12. Dynastie, Europäische Hochschulschriften 1986. Reihe III, Geschichte und ihre Hilfswissenschaften. Frankfurt, Bern, New York: Lang. Ian Shaw, Paul Nicholson: The Dictionary of Ancient Egypt, Harry N. Abrams, Inc., Publishers. 1995.